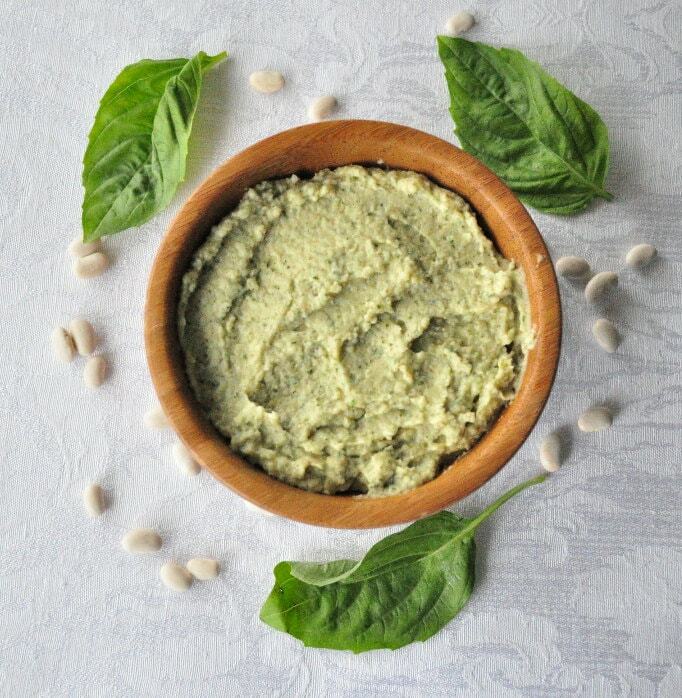 Healthy White Bean Pesto Dip. When I go to a party, I am all about the veggie platter. And what’s the best part of the veggie platter? The dip of course! After all, hummus is life! This healthy white bean pesto recipe is to die for. Perfect for any veggie platter. You can also serve it with chips. The creaminess of the white beans mixed with the basil and garlic really make the dish. If you’ve never tried a white bean pesto recipe before, this is a must try. While most dips are loaded with fat, the good news is, this white bean pesto dip isn’t and it tastes just as good! The secret ingredient… the white beans. It gives this dip that creamy texture. Throw everything in the food processor and blend until smooth. That’s it. Easy huh? You can use this recipe as a dip, or as a sandwich spread. Today I spread some of it on whole wheat lavash bread with some cucumbers and red peppers. It was yummy! It would also make a good pasta pesto sauce too. I hope you enjoy it. Great recipe! So nice for eating vegetables. I added walnuts as I would if I was making pesto. That sounds delicious too! I may need to try that next time. I also love using it as a sandwich spread. Are nutritional yeast and brewers yeast the same? It's been years since I've bought it. The dip sounds awesome. Thanks! I am not sure what brewer's yeast is. I get my nutritional yeast at the health food store. It has a nutty and cheesy flavor. Really good for you too. I googled it. I think Brewers Yeast might be a brand of nutritional yeast. Your description sounds the same. I first heard of it from a cookbook called the The Uncheese Cookbook. I always bought it from the bulk food section of my co-op. Thanks! Just thought you might want to know, brewers and nutritional yeast are not the same thing. :-) Great recipe by the way!! Yes, they are much different. Thank you! you don't cook the beans first? Just soak them? Will it still work alright if I used canned beans? I just have some I thought I'd try and use up. Or are the dried the best choice? Does this keep at all or do you have to use it same day? Yes! It should last a week in the fridge and you may even be able to freeze it. Sounds delicious! Can I leave the yeast out or will it screw up the recipe? We put the nutritional yeast in for a bit of a nutty and cheesy flavor. You can probably leave it out if you want. Just made this and added a jalapeño for extra kick. So yummy - loved it! Great recipes! Thank you so much for keeping me inspired to create more and use yours as well in my cooking. Wondering if you are full on vegan, as every recipe I have come across is. I have 3 girls and we are all oil free, whole food vegan. Keep it up, much appreciated. Am very interested in this! Do you use the nutritional yeast more for the flavour? or is there some nutritional value in it of which I'm unaware? How do you reconcile it with a "non processed" clean diet approach? Glad you enjoy the recipes! :) You can try with prepared pesto. It could work. Let me know the results.